Keystone Compliance offers immersion testing to depths exceeding 100 feet. Immersion test setups are often unique to the test article and require the use of specialized pressure vessels. 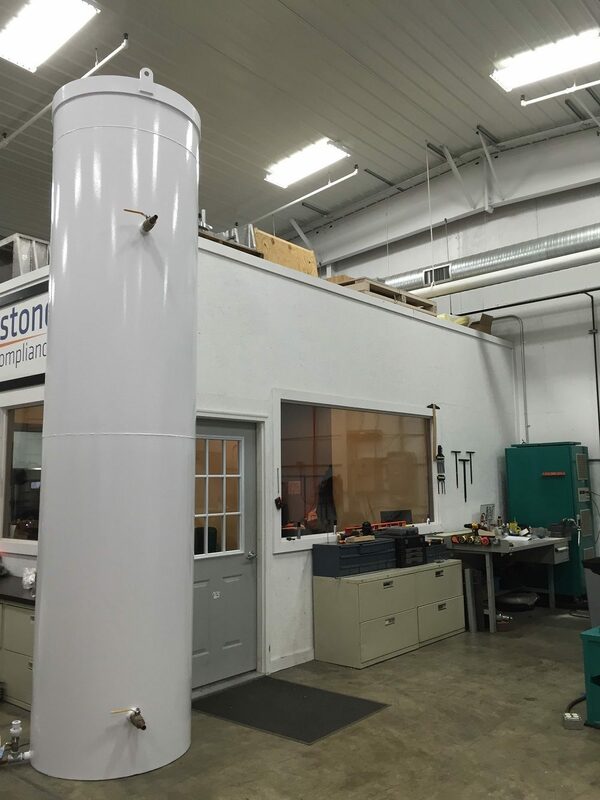 With multiple pressure vessels available, Keystone Compliance is able to offer immersion testing of various-sized test articles to almost any depth. Keystone Compliance operates various pressure vessels and associated support equipment. Keystone equipment is capable of simulating depths beyond 100 feet. One of the immersion test tanks measures 16 feet tall and has a radius of three feet. Immersion testing, per MIL-STD 202 Method 104, is performed to determine the effectiveness of the seal of component parts. The immersion of the part under evaluation into liquid at widely different temperatures subjects it to thermal and mechanical stresses which will readily detect a defective terminal assembly, or a partially closed seam or molded enclosure. Defects of these types can result from faulty construction or from mechanical damage such as might be produced during physical or environmental tests. The water immersion test is generally performed immediately following such tests because it will tend to aggravate any incipient defects in seals, seams, and bushings which might otherwise escape notice. This immersion test is essentially a laboratory test condition, and the procedure is intended only as a measurement of the effectiveness of the seal following this test. The choice of fresh or salt water as a test liquid is dependent on the nature of the component part under test. When electrical measurements are made after water immersion test cycling to obtain evidence of leakage through seals, the use of a salt solution instead of fresh water will facilitate detection of moisture penetration. This test provides a simple and ready means of detection of the migration of liquids. Effects noted can include lowered insulation resistance, corrosion of internal parts, and appearance of salt crystals. The salt water immersion test described is not intended as a thermal shock or corrosion test, although it may incidentally reveal inadequacies in these respects. Keystone Compliance is an immersion test lab with significant experience. Contact us to determine how we can help you address the seal of your enclosure by relying on our water immersion test expertise.